The power supply and vibrato circuits are mounted inside a shielded metal case mounted towards the front of the organ. One side of the power supply is exposed through the front face of the organ. AC input and audio output connections along with an AC line reverse switch and fuse are located there. The power supply is fastened with two screws through the front panel and two nuts on the bottom. It is connected to the organ circuits through an nine pin "octal" style plug. The purpose of the V301H power supply is to convert the input voltage (120 Volts AC) to approximately 8 volts DC. To accomplish this, the V301H power supply has a step down transformer, a diode bridge, "smoothing" or filter capacitors, a regulating transistor to remove any AC ripple left by the filter capacitors, and lastly, a zener diode to precisely establish the final, or "B+" voltage. 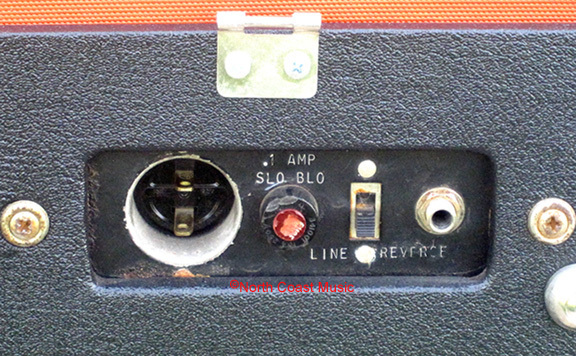 A small .1 amp Slo Blo fuse protects the organ and power supply from shorted components. 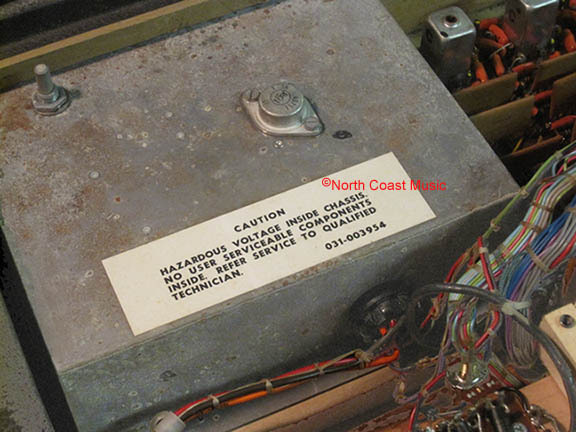 The organ vibrato circuit is installed onto two tag strips also located inside the power supply case. 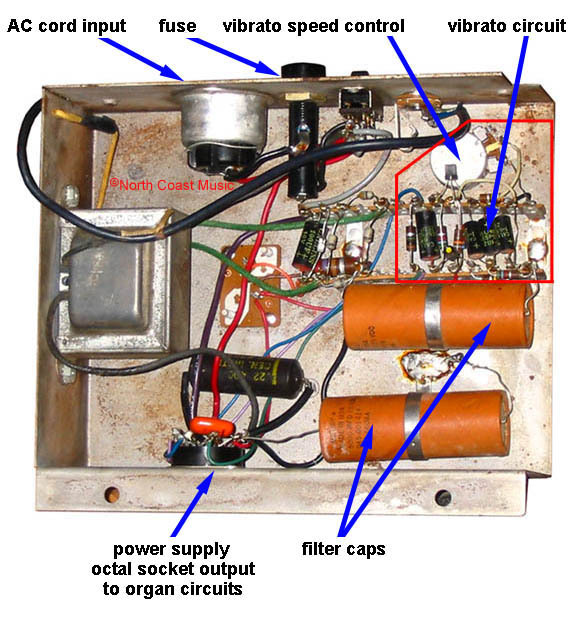 A rotary potentiometer is connected to the vibrato circuit and protrudes from the top of the power supply case. This control adjusts the speed or rate of the vibrato. You might wish to purchase the recent North Coast Music remastering of the Vox V301H schematic to help you repair its power supply, Parts values for all capacitors, resistors, and diodes are included in this schematic. Click here to purchase this from North Coast Music.